SNAFU! : Transgender soldier to receive rank, pay and benefits after prison? Transgender soldier to receive rank, pay and benefits after prison? Thanks to Mobeius2249 for the link! Pvt. 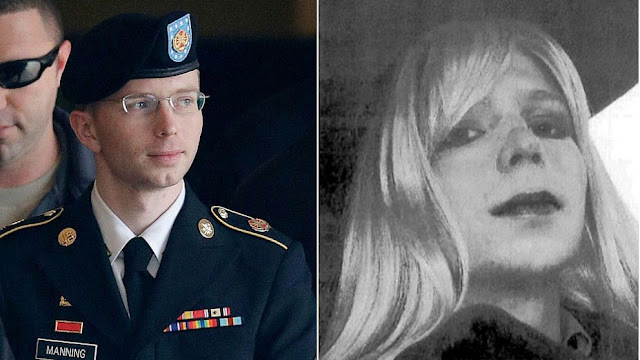 Chelsea Manning, the transgender soldier and convicted national security secret leaker, will remain an active-duty, unpaid soldier, eligible for health care and other benefits, following her scheduled release May 17 from military prison at Fort Leavenworth, Kansas, according to the Army. Manning entered prison as a man named Bradley. Manning changed her name, identified as a woman and received hormone treatment while incarcerated. Her sentence was commuted in the final days of the Obama administration, a move that infuriated some in the military and President Trump. While Manning’s court-martial conviction remains under appeal, she will remain a private in the Army, said Dave Foster, an Army spokesman. As an active duty soldier, Manning will continue to receive health care and have access to commissaries and military exchanges, but she will not be paid. “Pvt. Manning is statutorily entitled to medical care while on excess leave in an active duty status, pending final appellate review,” Foster said. I ask again. Is this legal? I don't recall ANYONE receiving this kind of treatment. Is this because he became a she and is now a transgender person? Don't really care. If he wants to cut off his willy then that's cool but we should treat everyone the same when they've been convicted of a crime.